Facebook(s fb) may be the world’s most popular social network, but when it comes to social messaging, other apps are usurping its dominance. Facebook Messenger is still the most popular smartphone social messaging app in the U.S., according to a survey conducted by On Device Research, but polls in four countries in different regions of the world found WhatsApp and WeChat are the reigning services. As you might expect, China’s homegrown WeChat dominates its home country with 93 percent of On Device’s respondents saying they use it weekly. Facebook services have been banned in most in China since 2009, but in Brazil, Indonesia and South Africa — countries where Facebook apps are readily available — WhatsApp is by far the most used app. 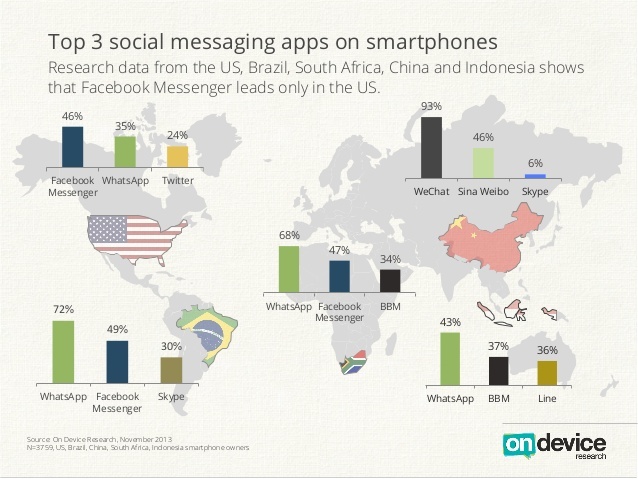 In South Africa and Brazil, Facebook Messenger is firmly entrenched in the No. 2 slot, but in Indonesia it doesn’t make the top 3, according to On Device’s poll. 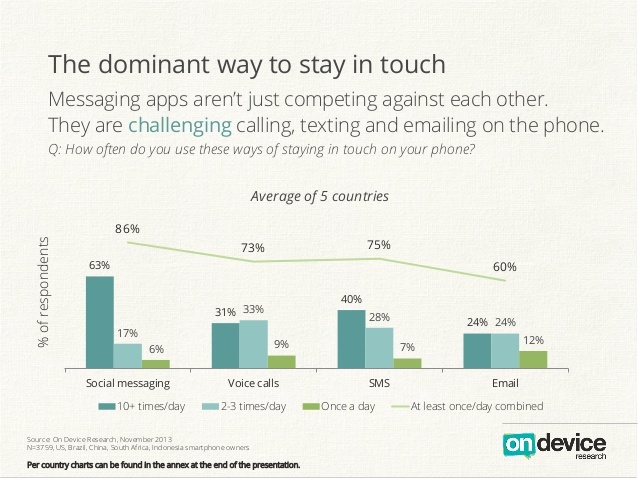 Focusing on single dominant apps, however, may not be the most relevant metric anymore. On Device found that the majority of its respondents — made up of 3,759 iOS(s aapl) and Android(s goog) phone users — used multiple messaging tools. Some 58 percent said that multiple apps were necessary because different friends used different messaging platforms, while 52 percent said made use of different features on different apps. While social messaging may be split between multiple apps, IP communications as a whole has definitely overtaken SMS as a means of daily communication. On Device found that 63 percent of respondents in all five countries used IP messaging apps 10 times or more daily, while the number was only 40 percent for SMS. Another surprising finding in On Device’s survey was the rapid adoption of BlackBerry(s bbry) Messenger on iPhones and Android devices. BBM only went live in the iTunes Store and Google Play in September, but On Device’s November poll found it had already become the second and third most popular messaging apps in Indonesia and South Africa respectively. WeChat is also showing signs of breaking out of China’s borders. It’s already a routinely used app in South Africa and Indonesia, and even 6 percent of U.S. respondents said they used it weekly. Ah, gone are the days of the good old MSN Messenger. 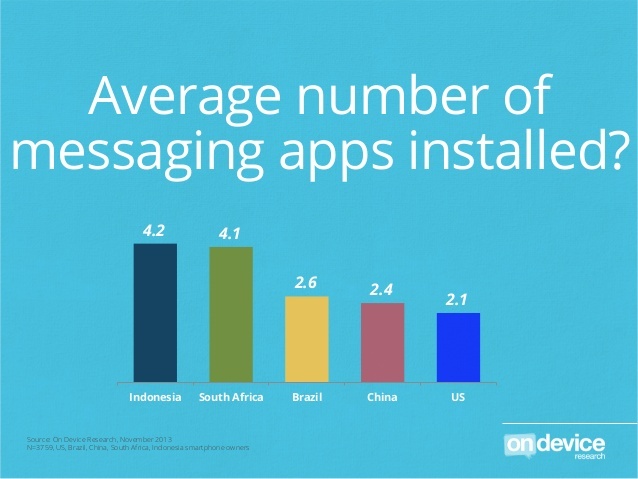 But I agree with TDW – India should have been included here which uses Whatsapp almost exclusively. I am surprised that BBM actually made an impact, as although a lot of people did download it and try it out – most agreed that it was not as efficient or effective as the other messengers out there. Nevertheless, WhatsApp isnâ€™t the only adversary for Facebook. 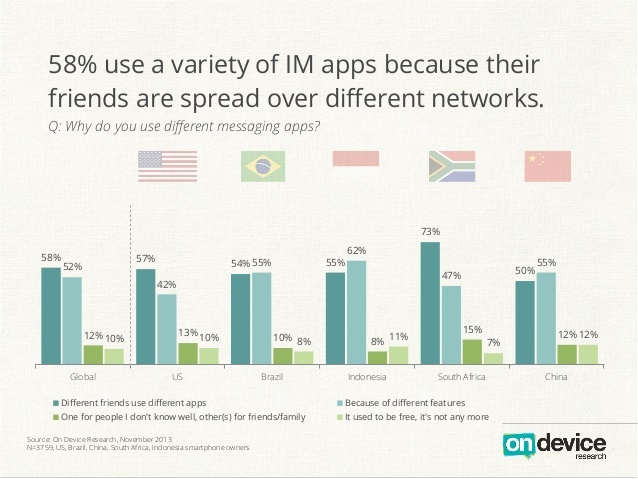 Some other mobile messaging apps like WeChat, Line and KakaoTalk are also adding to Facebookâ€™s dilemma. Facebook has also official acknowledged that the number of daily users on the site is going down. 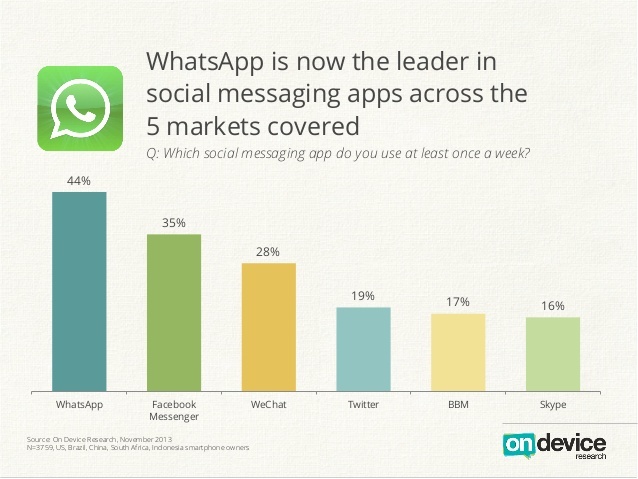 agree with TDW…no one I know in India uses anything but WhatsApp…I guess WeChat would run a distant second. Yay!!! WhatsApp has replaced Facebook in my life. You didn’t include WhatsApp’s probably biggest market: India…unless you are considering the fact that there is no other service being used by Indians at the moment.